Viva la vida (or Vita)! I'm eventually back! Haven't been posting anything for a year or so - just can't believe that. How come that I abandoned this blog? Even I myself have no proper answer to this question. But please, forgive me, my Dear - it's all over now, I'm back. I changed the location, university and my whole life dramatically, but that didn't affect my passion for cooking in any sense. I continue to fall in love with every single dish I make (take simple buckwheat with onion and mushrooms - wow, these smells were just adorable yesterday, couldn't stop sniffing it with my blocked nose). I am still striving to make a delicious seducing masterpiece of every ordinary dish. And, of course, as I was back to Russia during these Christmas holidays, I brought my camera to London. I just realized it's high time I revived Such Yummy Stuff. 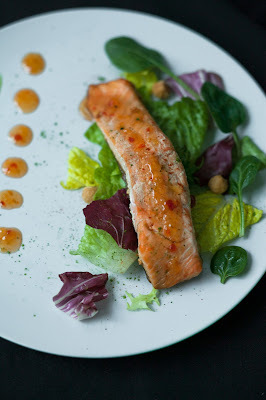 The first thing I'm gonna share you with is a simple but yet super-appetizing oven-baked salmon. 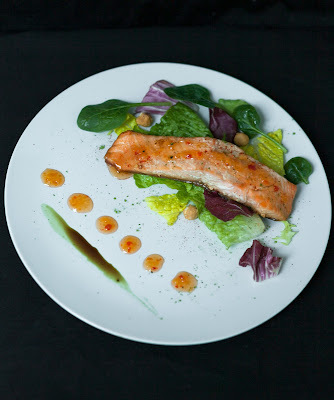 It doesn't matter either you're a newbie to cooking or an chef/sous-chef at the posh Michelin rated restaurant you ought to know how to cook salmon properly. That's the point! Believe it or not, this is one of the simplest and just my fav of all times! Since the time I moved to London last year, I've been cooking it several times a week and still love it wholeheartedly. 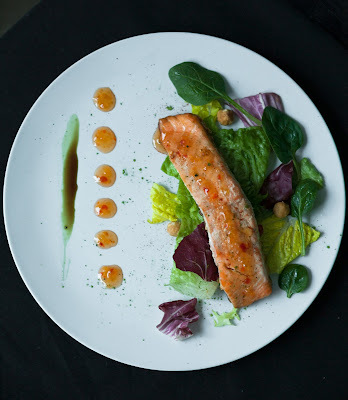 So.. What actually do we need to cook a good salmon fillet? 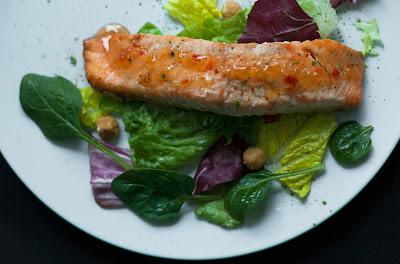 A good salmon fillet - I personally prefer M&S, but Tesco will do as well! 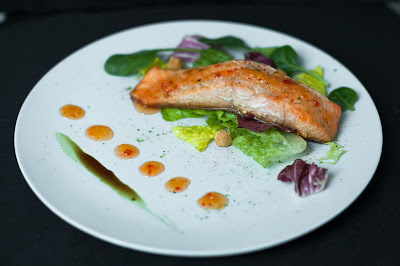 This salmon in the picture was bought at Tesco btw, so don't hesitate going there If you just bump into it on your way home. The next thing on the list is any savory sauce. You can follow me and use Sweet Chili Sauce. Use your imagination - make Hollandaise (that will be fab as well as they are a perfect combination) or teriyaki sauce (fav fav of all times!). The last thing on the list is the foil, but I'm sure that, basically, everyone has it at home. Now it's time for a recipe! Release the fillets, wash in cold(!) water. Gently pat it dry with a paper towel. Put it on a baking tray lined with the foil beforehand. I always shape a "box" of the foil by folding the sides - in that case the sauce and the juices don't run out. Then shape the covering part for our foil box. Set aside. Season your salmon with the soy sauce, then sprinkle with herbs, ground pepper and garlic powder. Pour a bit of chili sauce all over the fillet, cover the tray with lid and out it in the oven. Wait for exactly 27 minutes. Release from the oven. Salmon perfectly goes together with some buttered spinach, egg-fried or boiled rice and fresh vegetable salad. Don't you also hesitate to have a glass of Pinot Grigio together with it. Enjoy! Назовем это возвращением блудного попугая.. Всем привет, прошел почти год со времен последнего поста. Просто ужас, как быстро летит время. Признаться честно, этот год просто перевернул мою жизнь с ног на голову, много чего изменилось, но некоторым традициям я все же не изменяю. Я все еще получаю истинное удовольствие от готовки. Просто на этих каникулах зимних, когда я была дома, я решила - все, хватит блоготунеядства, ведь я последнее время довольно много готовлю и совсем никому ничего не показываю и не рассказываю об этом. Если раньше были в основном сладости и выпечка в моем исполнении, то сейчас я в легкую управляюсь с полноценными основными блюдами. В общем, сегодня я пришла сюда как в гости, а в гости с пустыми руками не ходят - рецептик лосося в сладком чили соусе прилагается! Разогрейте духовку до 180 С. Достаньте рыбу, промойте холодной водой, аккуратно вытрите бумажным полотенцем. Из фольги сооружаем небольшую такую "коробочку", просто подогнув все стороны. Это нужно, чтоб соус не вытекал в процессе готовки. Кладем рыбку на центр фольги, поливаем слегка соевым соусом. Потом добавляем все сухие приправы. Последним нужно полить соус чили. Накрываем крышечкой такой же из фольги и отправляем в духовку. Только фольга не должна желательно соприкасаться с филе, иначе она может пригореть к нему. Для этого я и делаю объемные крышечки. Отправляем в духовку ровно на 27 минут. Достаем, подаем, наслаждаемся. Есть лучше сразу, естественно! Лосось замечательно сочетается со шпинатом, тушенным в масле с чесночком, простым рисом или свежим овощным салатом. Не забудьте о бокале белого сухого в довершение ко всему.